How to get there: On the waterfront, Pier Road. Without a doubt, Kinsale is on the itinerary of pretty well every tourist who comes to our shores, be they foodies or yachtties, or just plain wanting to visit this pretty town, which has achieved world wide fame. We went on our honeymoon to Kinsale and have been up and down a few times every year since to this gorgeous romantic town with its narrow colourful streets and myriad of restaurants. 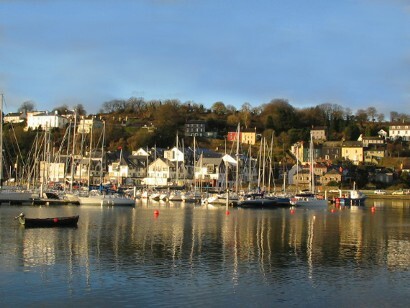 There is always a buzz in Kinsale – be it winter or summer – in fact we like it even better out of season. Right on the marina, just beside Kinsale Yacht Club, is Shearwater, a new development of exclusive magnificent apartments and duplexes in what is probably the most stunning location in Ireland, never mind Kinsale, unrivalled and unprecedented. Available for short-term letting in Shearwater is a magnificent duplex, which very comfortably sleeps up to four people. The steps up to the front entrance bring you into your own little world that is so modern and airy that it has the feel and panache of a New York loft. The first floor has two bedrooms. The very spacious master bedroom, which is ensuite, has a super kingsize bed, which can convert to two singles. The guest bedroom has two single beds and both have views of the harbour. Upstairs leads you to the most amazing enormous room with high Cathedral ceiling and velux windows. There is a bay window at one end with views of the boats and out over the roof tops of Kinsale. It is very stylishly furnished with eclectic Franco Chinese furnishings. The kitchen area is beautifully constructed and fitted with everything anyone could possibly want. There is private secure car parking and on the ground level is Vista a coffee/wine bar so you just nip downstairs and pick up your croissants for breakfast. Live the dream – you won’t want to leave.